“Meet us at N 81° 27´ E 25° 57´ on Jan. 12.” That was the message from the Norwegian Coast Guard ice breaker. So our research vessel RV Lance met KV Svalbard some 35 nautical miles due north of Sjuoyane, the last rocky outcrop of Svalbard. 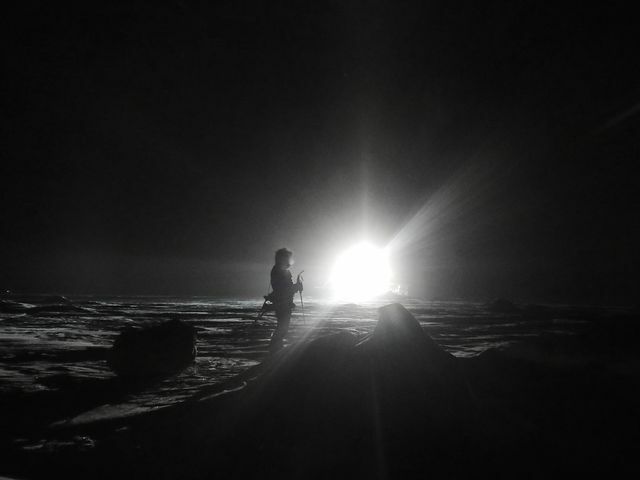 It was pitch dark: ice everywhere, dead calm and -30C. Precisely what we wanted. The Arctic Ocean is shifting to a new regime, where younger and thinner ice is replacing the thicker, older sea ice. Now much of the Arctic Ocean is open water during summer – contrary to earlier, when it was ice-covered all year. Will this previously ice-covered ocean become our new “bread basket”? We don’t know. How will it affect local weather and global climate? We don’t know that either. Much of our current knowledge about Arctic sea ice stems from the former old-ice regime and gives unreliable predictions for the future. To improve our ability to make good predictions, we need to learn more about how the new thin Arctic sea-ice system functions. With that in mind, the Norwegian Polar Institute led a research project called “Norwegian young sea ICE cruise” (N-ICE2015). We froze RV Lance into the sea ice in the Arctic Ocean north of Svalbard and let it drift from January to June 2015 to study the thinner sea ice system. We hoped to follow individual ice floes as long as we could, learning all we could about external forces on the floe, effects on the ecosystem, and ocean chemistry, including ocean acidification. Understanding the new ice regime requires us to study everything simultaneously. That is exactly what we did – we studied it all. One of our key goals was to understand what causes freezing and melting of the ice in this region. Freezing is reasonably straightforward since it is caused by lack of sun and cold air. Melting also appears obvious: Ice melts when exposed to heat (or energy). But the interesting question is where the energy comes from and when. There are two sources of heat – the ocean and the atmosphere. Atlantic water (about 3.0C or 37.4F) that flows into the Arctic Ocean west of Svalbard is relatively heavy and it moves below the fresher and colder Arctic water. If left alone, it ends up at 70 meters (230 feet) depth – where it melts little ice! But it isn’t always left alone. Storms over open water mix the ocean and bring the warm Atlantic water to the surface. The same storms set the ice adrift, which also causes mixing. Storms in the Arctic can be fierce. During one storm, Lance and the entire ice pack drifted at a speed of 1.2 knots! Temperatures rose from -35C (-31F) to -2C (28.4F) in 30 hours, bringing vast amounts of “hot” air into the Arctic. Then they plummeted to -40C (-40F) in a couple of hours. After the dark Polar Night, the sun returns, bringing heat that contributes to ice melt and providing the light that algae need to grow and become food for the whole ecosystem. Understanding the fate of the sunrays is not trivial. Just 10 centimeters (4 inches) of snow stops most of the light from penetrating the ice because it is reflected (albedo). That means the amount of energy available to the primary producers in and under the ice depends on snow depth, distribution and ice thickness and quality. We studied the fate of the Atlantic water by measuring temperature and salinity at different depths throughout the cruise. We also measured the vertical movement of water with a special instrument. Above the ice, turbulent air also moves energy, so we measured air movement with the same type of instrument. The lower atmosphere was studied using a 10-meter (30-foot) weather mast mounted on the ice, and conditions up to 30 kilometers (18.6 miles) with weather balloons launched twice a day. Since the ship interferes with these instruments they were installed at what we called the “super site” about 450 meters (0.28 miles) away. The super site was powered by cable from the ship to avoid local contamination by generator exhaust. The ice thickness is the end result of all the processes described so far, but snow on top of ice complicates matters because it insulates ice and prevents its growth. Throughout the cruise, the sea ice and snow team measured the total thickness of the sea ice and snow with an instrument called EM31, and snow thickness with a glorified stick called a magnaprobe. Obviously, people dragging a sled cannot cover large areas, so to broaden our range we measured ice characteristics from a helicopter in spring. Categorizing ice from airplanes or satellites is tempting, but we need to calibrate the algorithms these long-range measurements use. To do this, accurate first-hand knowledge of actual conditions is essential. Two projects, ICE-ARC (British Antarctic Survey, Technical University of Denmark, E.U. and European Space Agency) and NASA’s Operation IceBridge, flew low passes over the ice near the ship, measuring ice thickness, snow and surface characteristics. Just after they had flown over us, we went out and meticulously measured the same area. Satellite images were checked in the same way numerous times. As the ice pack becomes thinner, it appears to be moving faster, and may also be more sensitive to break-up due to storms and waves. We studied waves and ice movement using buoys that transmit data via satellite back to the lab. We deployed the buoys twice: once in January and once in early April, after Easter. 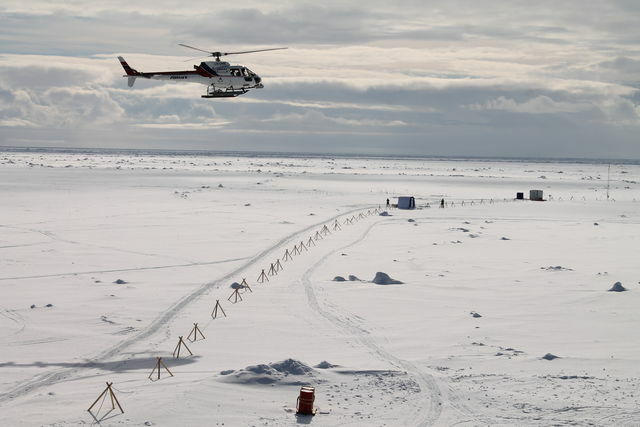 The Easter deployment used a helicopter, but the January deployment was special, since the buoys were set out by skiers hauling sleds! Just imagine skiing off into the dark cold Arctic winter, away from the cozy Lance to spend a night or two on an ice floe. The biologists wanted to find out how organisms living in the sea ice and in the water below adapt to a thinner ice cover. One of the focal questions is whether under-ice phytoplankton blooms may become more widespread in the new ice regime, as seems to be happening elsewhere in the Arctic. Changes in the timing and magnitude of the ice algal and phytoplankton bloom will affect primary consumers and ultimately the entire ice-associated ecosystem. Carbon dioxide lowers the pH in seawater, and ocean acidification may perturb many organisms and threaten the ecosystem. Winter data from this region have been scanty, but during N-ICE2015 we measured carbon dioxide in the ocean continuously. 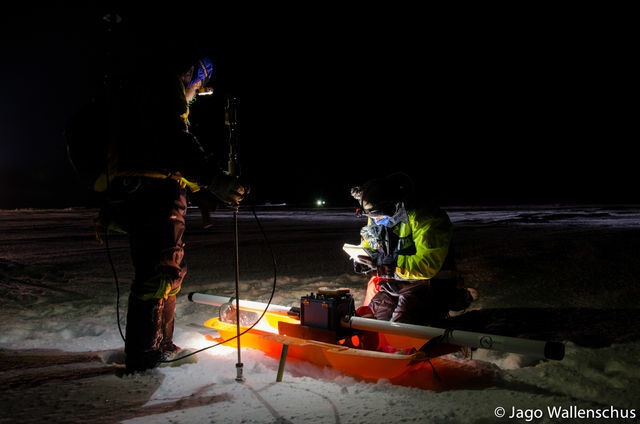 Having a safe, comfortable research station north of Svalbard from winter to summer offered unique research opportunities, and N-ICE2015 brought together many experts. The project was truly an international expedition with scientists from Canada, Denmark, Finland, France, Germany, Japan, the Republic of Korea, Norway, Russia, the United Kingdom and the United States. The national and international collaboration strengthened the scientific outcome and increased the output tremendously. Follow the project at the N-ICE2015 website and on Instagram . This piece originally appeared in Fram Forum 2016 , under the title “N-ICE2015: Following Sea Ice From Winter to Spring,” and is reprinted here with permission. Fram Forum is a publication of the Fram Centre, Norway’s High North Research Centre for Climate and the Environment. The views expressed in this article belong to the authors and do not necessarily reflect those of Arctic Deeply. Harald Steen is a seabird biologist by training and is currently the leader for the Norwegian Polar Institute’s Centre for Ice, Climate and Ecosystems (ICE). Mats Granskog is a polar oceanographer and sea ice scientist and is the Chief Scientist of the N-ICE2015 campaign.